The Vilcabamba trek to Machu Picchu is a hidden treasure that has yet to be heavily impacted by tourism. The trail is remote, very beautiful and super quiet. Trekkers get to pass through snow-capped mountains on a number of original and well-preserved Inca trails. The trek is typically completed on a 5-day itinerary, although there are variations, particularly on the route out to the trailhead. Prior to the hike most trekkers will spend two days in Cusco acclimatising. If you have booked with a tour operator they will likely have organised your hotel and scheduled some city tours. Remember, Cusco is situated at 3,400m / 11,150ft and you might start feeling the effects of the altitude as soon as you arrive. Try to remain well hydrated and don’t over-exert yourself by traipsing across the city – see information on acclimatisation below. We are big fans of the Vilcabamba trek but should point out that it is one of the more challenging trails to Machu Picchu. There are a number of tough ascents and descents that require a good level of fitness, and trekking days are long and tiresome. On this page you will find all the information you need to prepare for an amazing Vilcabamba trek experience, including a detailed overview on all route and itinerary options for the trek. You will also find useful information on acclimatisation and altitude sickness, guidance on what to pack and when to book your trek, information on tour operators and other frequently asked questions. We recommend bookmarking this page for future reference. Please feel free to share this page with friends and family, link to it from your blog or give us a shout out on your social media page! If we haven't answered your question below, leave a comment and we will respond within 24 hours. Here is a typical 5-day Vilcabamba trek to Machu Picchu itinerary. Tours generally start very early, around 4am. Trekkers are transported from Cusco to the town of Ollantaytambo where you will likely stop for a brief rest before continuing up and over the impressive Abra Malaga Pass at 4,316m / 14,160ft. From here you descend into the Vilcabamba valley to Santa Maria or Chaullay (1,890m / 6,200ft) and then continue onwards to Huancacalle where you will camp for the night. 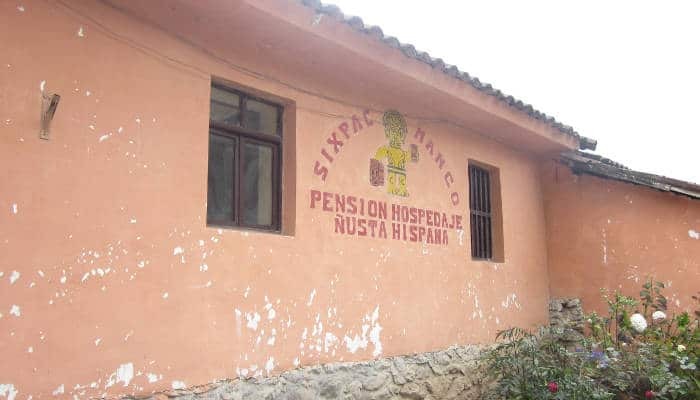 Right at the end of the town is a hostel where you can get a bed for 15 Soles, however, it is likely that your tour company would have already organised sleeping or camping arrangements. The archaeological sites of Vitcos-Rosaspata and the Ñustahispana (the White Rock) are nearby (1-2 hour hike away) and you will likely visit them in the afternoon or early the next morning. Hikers on the Inca Jungle Trek cycle from the top of the Abra Malaga Pass all the way to Santa Maria – a 60km windy and downhill route – where they overnight before trekking south to Santa Theresa. You can find out more about the Inca Jungle Trek here. Day 2 is a big hiking day. It starts with a 4-5 hour climb up to the Asuntina Pass (3,915m) where you will be presented with great views of the river and valley below. From here you will descend along an original Inca trail to the small village of Pillaukasa (3,860m / 12,664ft) and onto the campsite at Racachaca (3,570m / 11,712 ft). 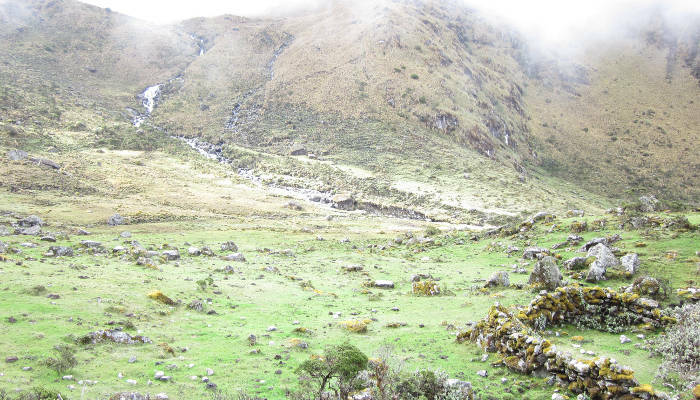 This is the toughest day on the Vilcabamba trail as you will traverse three high passes. The day begins with a trek up past Hatum Pampa (3,860m / 12,664ft) and on to the first pass, Yanococha (4,420m / 14,501ft). 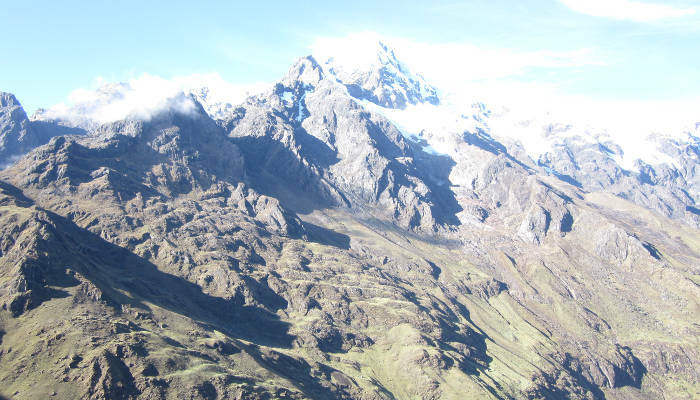 From Abra Mujun you will descend to the campsite at Mutuypata (3,000m / 9,840ft) via the small villages of S’aqra Cocha and Laccococha. The trail on the latter half of this trek is very muddy, particularly through the months of October-April. We highly recommend taking gaiters (see our packing list here for the Inca Trail which is perfectly suited for the Vilcambamba Trek as well). Day 4 begins with a gradual 4-5 hour descent to the village of Yanatile (note: as of 2014/15 a road is being constructed from the Hydroelectric Station to Yantile which interrupts the trail). On the way you will pass through high temperature jungle, before reaching coffee and fruit plantations that characterise this part of the trail. 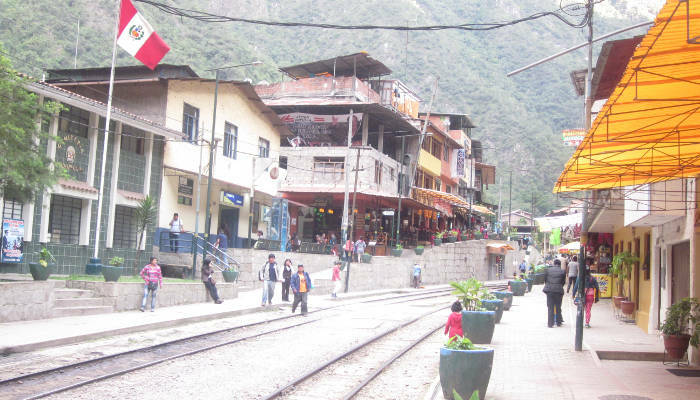 From Yanatile most tour operators use land transport to take trekkers to the Hydroelectric Station for lunch before continuing the hike using the trail parallel to the railway tracks to the town of Aguas Calientes (2 hours trekking). If you are exhausted by this stage you can catch a train from the Hydroelectric Station to Aguas Calientes, but it will set you back $25 for a 45 minute journey. You will overnight in a hotel or hostel here, and we recommend taking the opportunity to soak in the town’s famous hot springs (remember to bring a bathing suit)! 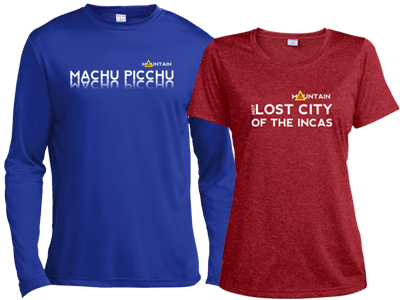 An early start, typically before dawn, on the first bus up to Machu Picchu will give you a chance of witnessing sunrise at the Watchman’s Hut, or from Inti Punku if you manage to get up really early. Most operators provide a 2-3 hour guided tour of the city before allowing you to explore the ruins on your own. If you still have the energy and are not too afraid of heights, it is worthwhile securing a permit to climb Huayna Picchu (the large mountain behind the city), as the views from the top are excellent. The climb takes about 1 hour to ascend and less time to descend (if you are unfit the climb could take you up to 2 hours). There are only 400 Huyuana Picchu climbing permits a day and only two climbing times (7am and 10am) so make sure to secure your place early (i.e. well before you arrive in Peru). You will need to get back to Aguas Calientes before your train departs for Ollantaytambo. Your tour operator will inform you of the time that you need to be back by. Note: if you would like to spend more time at Machu Picchu you will need to request this when you book your trip as securing an additional night in Aguas Calientes and a permit for an additional day in the citadel is very tough to do at the last minute. Good trekking maps are actually quite hard to come by for quiet routes like the Vilcabamba trek. The one below is from the Trailblazer Guidebook, mentioned in our library, and recommend as the leading guidebook for alternative Machu Picchu treks. Ignoring the map key and the scale, this map provides the geographic position of the Vilcabamba trek and its general route. If you trace your eyes from Cusco in the Southeast up to Ollantaytambo you will see the route a car / train follows into the Sacred Valley. Just North of Ollantaytambo you can see Mount Veronica (5,860m) which sits adjacent to the Abra Malaga Pass (4,316m). From here you will drive along the Rio Vilcabamba through Chaullay and onto Huancacalle in the Northeast. 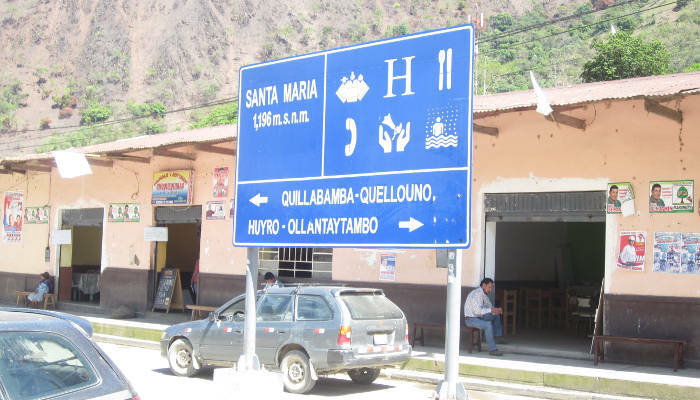 This entire section between Cusco and Huancacalle takes between 8-9 hours driving. Although not perfectly correct, from here the route bassically follows the green line and then the dark blue line all the way up to the Hydroelectric Station (labelled as La Hidroelectrica on the map) – approx. 60km and 3 days trekking, with a hour long drive between Yanatile (not shown on the map) and the Hydroelectric Station. As you can see from the map above there are two interesting variations on the Vilcabamba Trek. 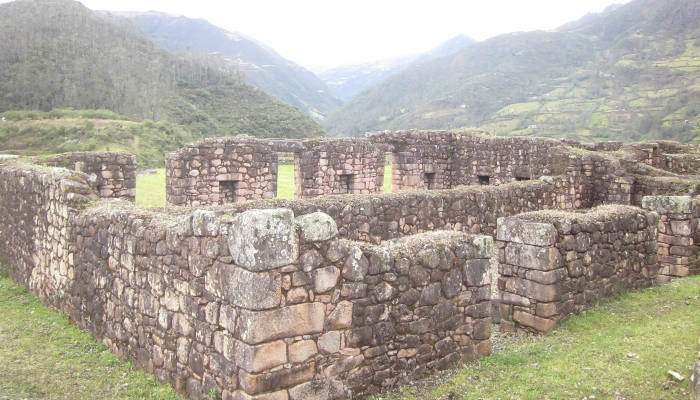 The first is a combination of the Vilcabamba and the Choquequirao trek. 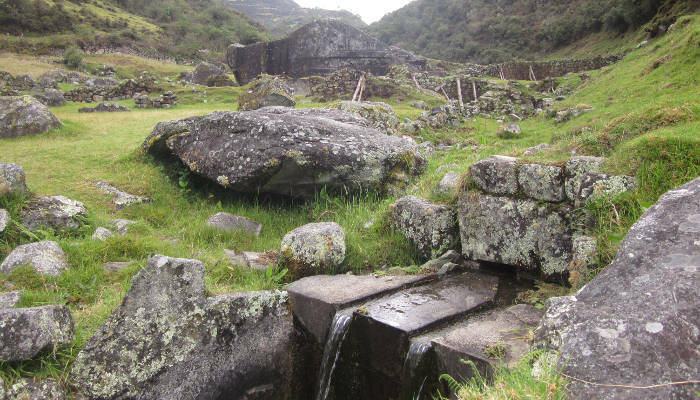 This route is ideal for trekkers who have already seen Machu Picchu and are looking for a challenging adventure to Choquequirao, the site of another well-preserved Inca site. The route typically starts in Huancacalle and follows the green line south to Cachora, although it is possible to do the trek the other way round. The route takes between 7 or 8 days to complete. The trek is not widely offered. This is the ultimate Machu Picchu Alternative trek. 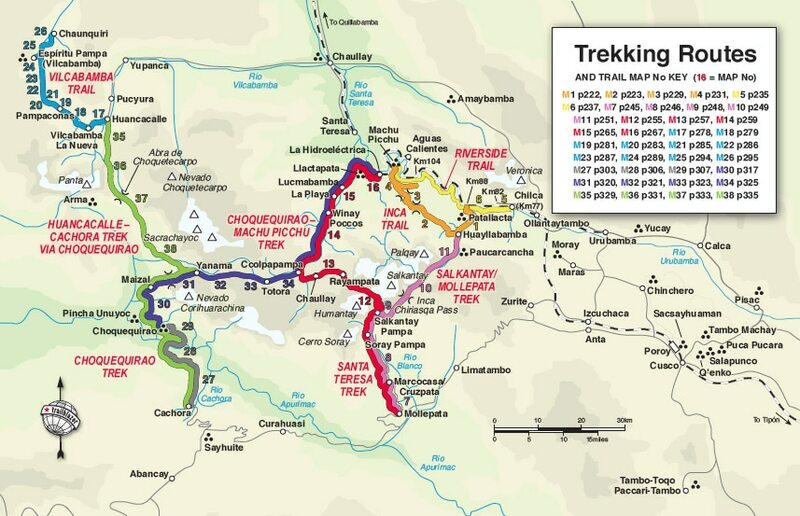 It combines the Vilcabamba and Choquequirao trek (the green line above) as well as the Espiritu Pampa (another Inca archelogical site) – seen as the light blue line above Huancacalle on the map above. The route typically traverses South to North, from Cachora to Espiritu Pampa and onto Chaunquiri (approx. 11-12 days trekking). From here trekkers are transported by vehicle to Quillabamba where most overnight and then take a bus to the Hydroelectric Station via Santa Theresa, and onto Aguas Calientes. The trek culminates with a full day at Machu Picchu. Again, this route is very rare (only a handful of operators offer it). The Vilcabamba trek is best done during the dry season (May-September). This is the peak time on the Classic Inca Trail, but on the Vilcabamba you will be lucky to see more a handful of trekkers (bliss!!). We do not recommend doing the Vilcabamba during the wet season (October-April) as rain and foggy weather is common, and obstructs the incredible views along the trail. At a push you could get away with a trek during the dry season shoulder months (October and April), but we generally recommend sticking to the dry season. Full historical details on weather patterns in and around Machu Picchu can be seen here. Please note, micro-climates predominate in the Andes. Plan for hot afternoons and cool to cold nights, with the possibility of encountering some rain all-year-round. Proper acclimatisation is a critical element of any Machu Picchu trek. Unfortunately, Cusco town, the main hub that trekkers fly into is already at high altitude (3,400 meters). From Cusco visitors or trekkers to Machu Picchu have two options: 1) either spend a few days (minimum 2) acclimatising in Cusco, or descend immediately to Ollantaytambo, a quaint town 60km northwest of Cusco in the Sacred Valley (2,792 meters) to acclimatise. If you are doing a trek with an agency it is likely that you will do option 2, as agencies usually book two acclimatisation days in Cusco at a hotel, as part of their tour package. The benefit of this is that you acclimatise to high altitude very early in your tour, which makes going over the 4,500 meter passes easier. The downside is that it is common to experience mild to moderate altitude sickness in Cusco. It is impossible to predict whether you will experience altitude sickness as there is little correlation to factors of age, gender, fitness etc. What is important is that you understand the process of acclimatisation, the symptoms of altitude sickness, and the best practice methods you can should follow to prevent any serious health complications. 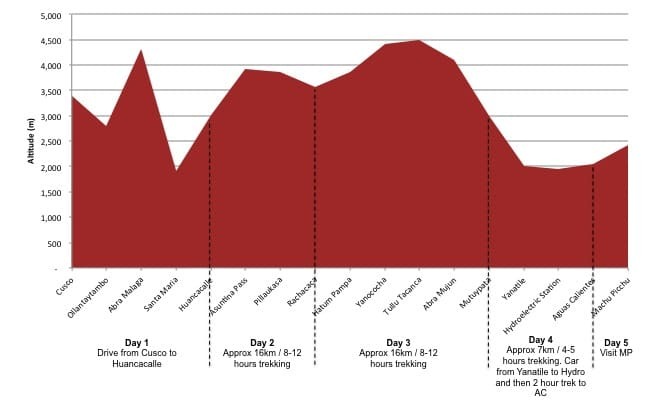 We recommend reading our detailed guide on acclimatisation and altitude sickness. The packing list for a Vilcabamba trek is almost identical to an Inca Trail packing list. The only noteworthy item that is unique to the Vilcabamba trail are gaiters, particularly on the afternoon of day 3! Here is a detailed packing list for the Vilcabamba trek. Then Vilcabamba trek is a real challenge. You will need to be physically fit and mentally strong to enjoy this trek fully. Check out our training and fitness guide here. Do you have any other questions about the Vilcabamba trail, or do you want to add your experience to this article, please leave a comment below, we welcome questions and constructive feedback. I am interested in the Vilacabamba Trek, Espiritu Pampa & Machu Picchu trek in April for 2 people. Can you please send me information on companies that offer this? Hi Helen, this is a rare route that is not widely offered by tour companies. Your best bet is to contact a tour operator who offers the Vilcabamba trek and see whether they can run the Espiritu Pampa extension. Hi, I was wondering if you guys are aware of any accurate topography maps of this area. Hi Paul, there are some good topographical maps available in Cuzco. Otherwise I would try searching the internet for ‘Cuzco region topographical map’. I’m planning a trip in 2019 and I would like to know if it’s possible to go to Machu Pichu via the Vilcabamba trek and return via the Salkantay trek, or vice versa. I would like to do this over a period of 8-10 days. Hi Monty, yes, this is possible. However there aren’t many tour operators who offer this and those that do will be expensive if you are trekking solo. 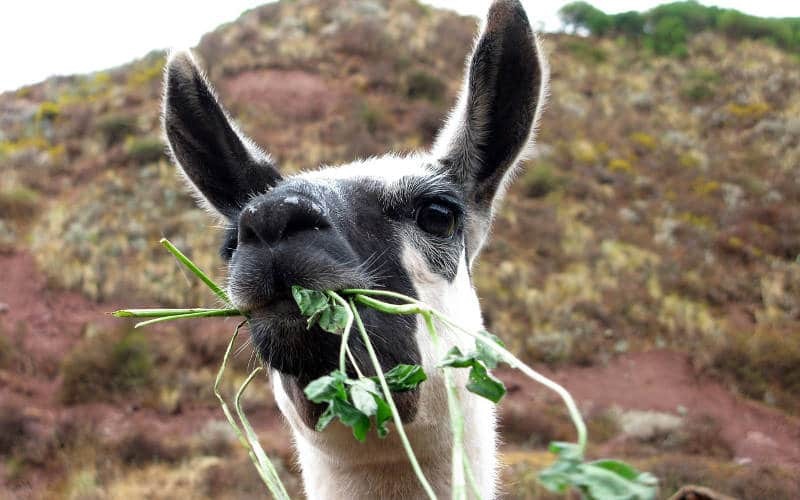 You may be best to try find a local guide once in Cuzco. All the best! Does this trek require a tour company or can this be done without a guide? Thanks! Hi Mike, I would definitely take a guide. The route is not well trodden or marked and you could easily get lost. That could be tricky. You will need to get from Aguas Calientes to Santa Teresa and then find someone to take you to Huancacalle.